This single includes 2 terrific modern soul nuggets which were produced and arranged by the most influential Disco producer "Patrick Adams", on his own label "Pap Records (Patrick Adams Productions)". Luckily, the both side was compiled by the "Goldmine Soul Supply" label on their first modern soul compilation, where you could learn that main ingredient had done an acceptable version of "everything man" on single and 12'' reggae disco / everything man. But who's made the original version ?!? Although this single is very rare (around US$ 1,000), you can also find a second pressing with an acceptable price knowing that apart from the address on the label, the reissue is indistinguishable from the 1st issue. Besides, don't miss their 2nd single everybody get off / everybody get off a great boogie tune from the early 80s. Probably my all time fave modern soul tune. 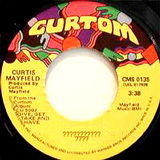 Produced by Curtis Mayfield or not ?? ?